Conveniently connected to key trade points of entry. 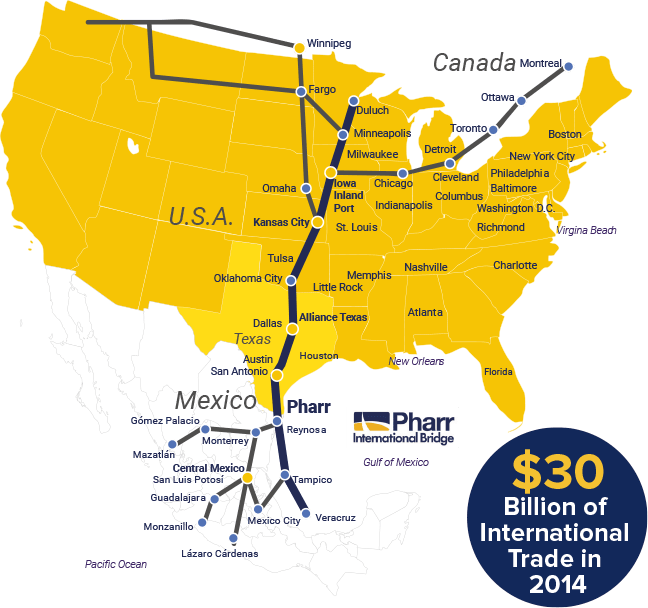 Pharr is a key point of entry for trade, providing air, sea, and land access to international and domestic markets. The Pharr-Reynosa International Bridge is the 6th largest land port in the United States. It currently processes over $30 billion in trade annually worldwide. The City of Pharr is conveniently centered on the intersection of if Interstates 69C and 2. It also provides convenient access to U.S. Route 83, the longest north-south highway in the United States. This strategic location with a strong customer base and direct access to major roadways makes Pharr one of the most attractive logistical points in the region. The Port of Brownsville is approximately 50 miles east of Pharr. It serves South Texas and much of Northeast Mexico. The Port of Corpus Christi, which is the fifth largest port in the United States, is located 150 miles north of Pharr. It handles over 6,000 vessels and over 80 million tons of cargo each year.